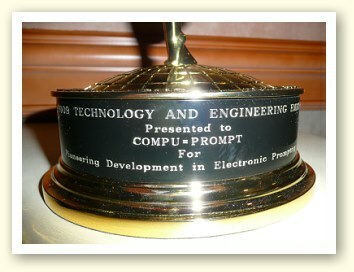 "Pioneering Development in Electronic Prompting"
Twenty-eight years after developing Compu=Prompt®, the first portable computerized teleprompting system, ProPrompt Inc. President Courtney M. Goodin and website developer Laurence B. Abrams accepted an Emmy award at the 61st Annual Technology & Engineering Emmy Awards ceremony. 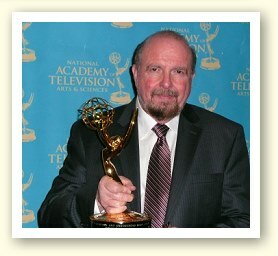 The Emmy was presented by the National Association of Television Arts and Sciences (NATAS) on January 7, 2010 during the International CES at the Mandalay Bay Hotel in Las Vegas. 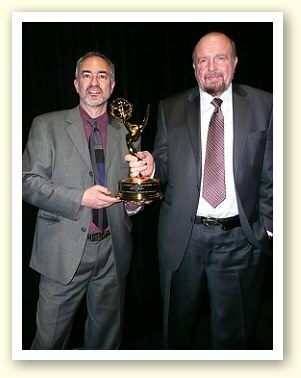 "Launched in 1948, Technology and Engineering Awards honor development and innovation in broadcast technology and recognize companies, organizations and individuals for breakthroughs in technology that have a significant effect on television engineering. 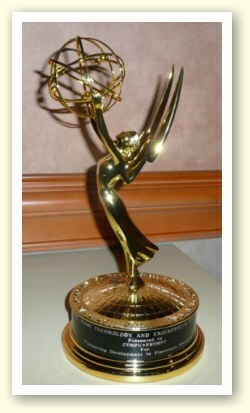 An award to an individual, a company, or to a scientific or technical organization for developments and/or standardization involved in engineering technologies which either represent so extensive an improvement on existing methods or are so innovative in nature that they materially have affected the transmission, recording, or reception of television."